But, as I watched Gremio v Corinthians I realised that despite the modicum of interest that I have for Corinthians I really didn’t care that much. And the game really did drag. Well, watching the two Euro games earlier in the day didn’t help. But, it also made me realise that this was in fact one of the problems with the game in Brazil – football fatigue. When I was a kid the start of a new football season was the thing I looked forward to most during the English summer (and that’s despite the fact I support Gillingham). The reason for this is because I hadn’t seen my team play for what felt like an eternity and if there were no Euros or World Cup then I wouldn’t have seen any meaningful football for at least a couple of months. In anticipation I’d save up my pocket-money during the summer holidays so that I could buy the new shirt at the first home game and I’d of course always go with a sense of misguided optimism. Like most fans, the long summer provided the opportunity to forget the previous season’s disappointments and it meant I’d go to the first game believing that maybe, just maybe, this might be our year! When you support Gillingham of course, it never is. Unfortunately, I’m not sure this works in quite the same way with the Brasileiro here in Brazil. Personally, with the league only four games old I already feel pretty indifferent about it. As a relative neutral (perhaps that’s one of the problems) I’m finding it very hard to take any interest in it at all. And what doesn’t help is the fact that many of the teams, players and supporters don’t seem to be that bothered either. This was one of the better attended games I went to during the Estaduais (Att: 19,437). Pretty poor for what should be the showpiece of Brazilian football. I guess my point is that if a relative neutral like myself watches a game on TV and sees a stadium that is not even a quarter full, what is there to inspire me to keep coming back for more in the future? Personally, I will carry on watching, but that’s just because I’ll watch ANY game of football. However, I’m not sure that will be the case for the occasional viewer who may happen upon a game shown on ESPN in Europe for example. To be fair, it’s not just a case of fans being fickle or lacking commitment. Far better and more knowledgeable writers of Brazilian football than myself (check out James Young and Euan Marshall) have already written about many of the problems with the way in which Brazilian football is organised, and how this can affect spectator attendance. My own observation, for what it’s worth, is that part of the problem relates to my earlier point about football fatigue. For example, the Premier League season finished on 13th May and the next one won’t start until 18th August, a gap of almost 100 days. This gives every supporter, no matter how crap their team is, plenty of time to forget about the previous season and to build-up their (false) hopes for the next. In Brazil? Well, here the football year is divided into two. Initially teams play in state leagues (Estaduais) which this year ran between 21st January and 13th May. Then they take part in the Brasileiro which kicked-off just a week after the Estaduais finished and which runs until 1st December. Assuming next year’s Estaduais start at a similar time there’ll only be a break of 45 days. But’s that not really the issue here because I think the main problem is that the Brasileiro starts just one week after the Estauais finish. In other words, Palmeiras fans who saw their team go on a disastrous run towards the end of the Paulistão then have to see their team carry that form straight into the Brasileiro (they are currently second bottom). But they need not worry because the club has kindly released a new shirt for the ‘new season’ to cheer them all up. The problem? 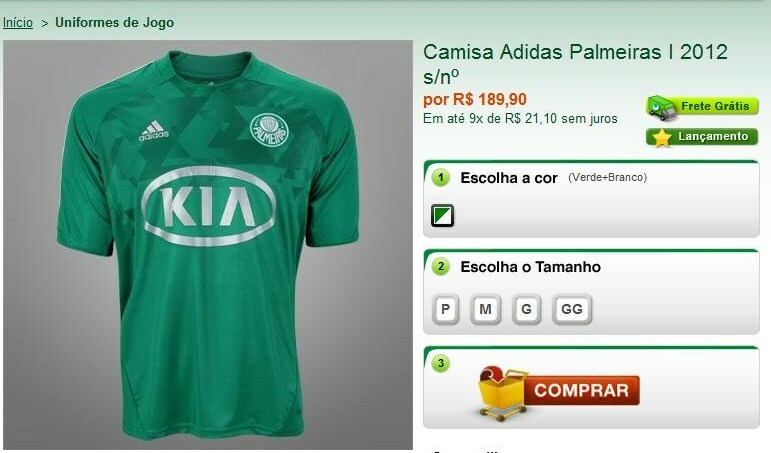 It costs a mere R$190 (£60). Can’t afford it? What do you mean your pocket money doesn’t cover it? Ok, get yourself a mortgage and pay it off in 9 instalments. And speaking off taking advantage of fans this brings me nicely to my next point. Tickets. 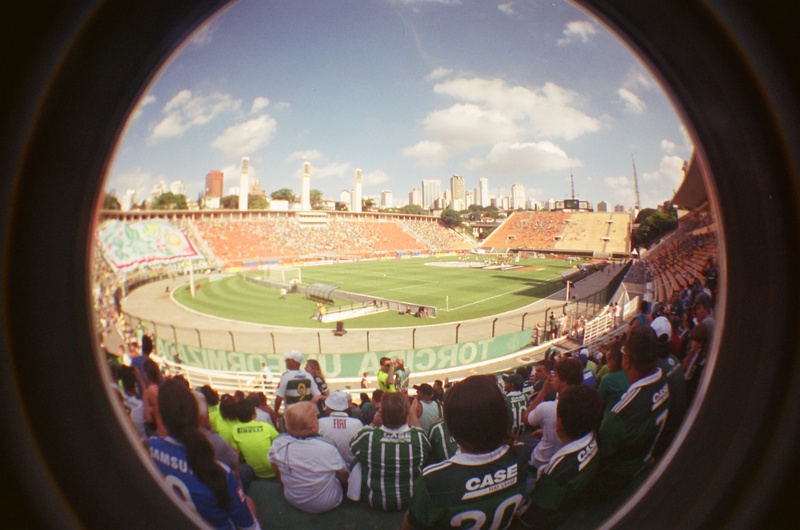 In São Paulo the cheapest tickets are R$30 (£10) although half this for kids and students. While that may not seem a lot compared to watching a game in the Premier League or even League 2 in the UK it’s still a hefty wack to pay out for the average Paulistano – especially given how many games there are. For example, to fit in the Brasileiro and Estaduais, as well as leaving space for the Copa do Brasil and any fixtures teams need to fulfil around South America, there are very often games most weeks on weeknights and at the weekend. And let’s face it, why would you pay for a ticket if many teams don’t even field their first teams? The reason they don’t is also to do with scheduling, because the Brasileiro starts as the Libertadores (South American Champions League) heads into its final stages. Additionally, it often coincides with a whole bunch of international fixtures because the European leagues have just come to an end. What this means is that the Brazilian teams who are still in the Libertadores will rest their big players ahead of knock-out games. Additionally, many of those same players may also have to travel to fulfil international commitments in Europe, the US or wherever else the Brazilian FA has flogged the Brazilian national team. As such, Neymar has not featured in ANY of Santos’s four games this season because he has either been rested for the Libertadores or away on international duty. And if this was not enough to put fans off attending games, the timing of games, often as late as 10pm on a week-night because they have to fit around TV Novelas (Brazilian soaps), means that even if some fans do want to go to the game they won’t get home unless they drive because the buses and occasionally the Metros have already stopped. The Euro is first priority now :). You nailed to the head. There’s not much I can add other to the fact that – believe me – the Brasileirão will eventually gain momentum. Also, I’m one of many that think the “mata-mata” system fits much better than the “pontos corridos” system here in Brazil though that’s not really the subject here.
. Thanks Eduardo. Please explain more about the mata-mata/ponto corridos. I’m unaware of what this means! Well, mata-mata is basically an american play-off system. The 20 clubs play only a “turno” (19 games) and the 8 best teams go on to the play-offs. It was very popular in Brazil during de 80/90’s and generated many upsets, like Robinho’s Santos in 2002, who were the #8 seed. Pontos corridos is the european system. 38 games and the one with most points wins the league. Though it’s way more “fair”, I find it less exciting. 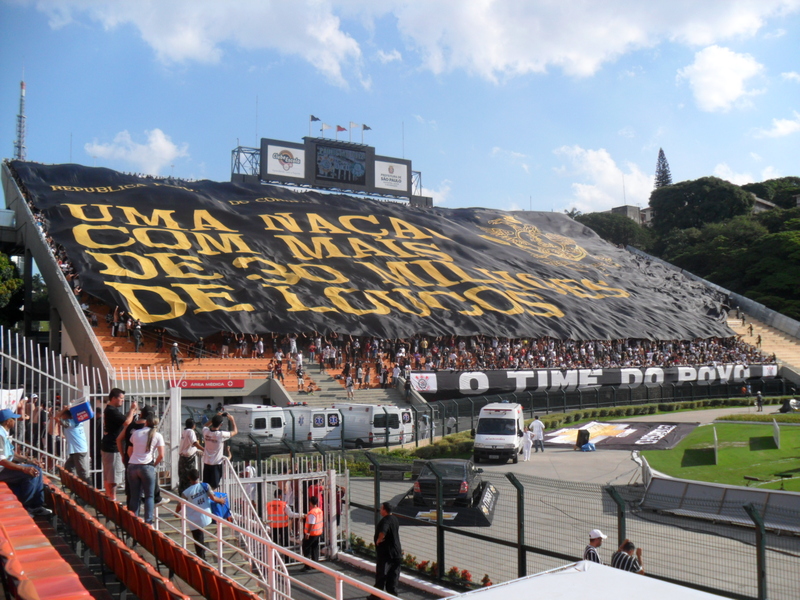 Yet, it’s all very debatable and the system itself is not really the reason the Brasileirão fails to gather a larger attendance and interest. Thanks everyone for their comments re: mata-mata & pontos corridos. Personally, I prefer the latter mainly because I think the team that proves themselves over a whole season should be the one that is crowned champion. Seems a little unfair if a team that finished 10 points behind then wins the championship….but perhaps that’s just my european mindset! Our stadiums are bad, and our people are not yet accustomed to the league system. in the final the public increases. In tournaments like Copa Libertadores (Latin American version for UCL), for example is very difficult to get a ticket to see the Corinthians play because the stadium has only 37,000 seats. Hey Andy, i saw your interview at the Expats site, and i found your site and twitter. Let me say that i think CBF should do what the great FA does in England: use whores and bribes to get what they want, put the ticket prices up in the sky to keep the Hooligans away from the stadiums and keep pretending they never existed (Heysel and Hillsborough, two words i never see you use, Andy) and let criminal petrobilionaires take care of their teams, like Chelsea and Man City showed us.. I know that this modus operandi custed you brits the 2018 World Cup, taked away from you guys by that ThIrd-World lover named FIFA, but, hey, man, fun is the main goal here, right? It’s all about the pose. If you are the main association from a two thousand years-old Empire, you can do anything you want, and be applauded by youg tools like you; but if you are a association from a third world shithole (as Brazil is lovely known in the Old Continent), then you are under constant survellaince, and anything you do is wrong and corrupt. And i see your twitter, and you never mentioned any of the violent and racist events that are taking place in Ucraine and Poland during the Euro, and at the same time you twit any news that criticize the 2014 World Cup organization, and with a martial frequency. Europeans take care of each other, right? And at last, let me return to the double H’s matter, and say to you that in the eighties Brazilian stadiums were always packed, and we never had any tragic event like Heysel (where Liverpooll fans showed the Belgians how to start a party!) and Hillsborough (men, look at the words again!) happening. But WE are the animals, not you. Hi Luis, thanks for your comment. Firstly the FA in the UK has no control over ticket prices, it’s driven by market forces. Also, this is not the only reason why hooligans don’t cause problems anymore. Policing and legislation to tackle the problem have improved vastly to ensure that stuff like Heysel never happens again (it was over 20 years ago by the way). Secondly, I, like many Englishmen would be, am offended if you are implying Hillsborough was an act of hooliganism. The reason stadia is improved is because of that very tragedy. You accuse the FA of being full of crooks but they’re obviously not very good ones if we didn’t get the World Cup, right? I really think you need to do some more reading about the CBF my friend. As for Chelsea and Man City I agree, but I’m not here to write about English football because I live in Brazil. Most of the people who read this blog are likely to live in the UK so they have no need for me to tell them about what they already know. They are more interested in what’s happening here because the coverage there is not very good or extensive. I’ve never described Brazilians as animals and never would. Look, I understand if you are defensive about your country and that’s fair enough but if you just want to ignore what’s going on here then that’s fine. If you’re happy with what I described (and you don’t seem to dispute what I said) then that’s also fine because nothing will ever change. I really don´t know why you bother Andy. They just don´t listen and the discussion is endless. Still catching up on your posts Andy, love this one as well. The 10pm start times floored me when I first arrived last year. How does anyone attend these games? Can’t agree more on the timing of the seasons either. Fans need that break to forgive and forget. Not sure what the fix would be, but watching B squads almost mid-way through the season is sad.